This case study examines how BlackBoard Collaborate was used to record student presentations for creating a course library, which was utilized in individualized student teaching. The recordings evolved into a strategy for feedback and improvement in performance. Moreover, the recordings provided a learning environment, which promoted and valued critical thinking, self-evaluation and self-awareness. 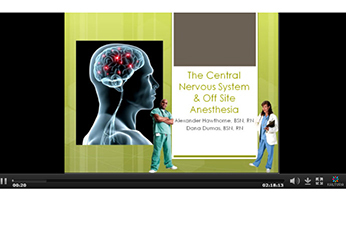 The objective of students presenting on a specific anesthesia care-focused topic aims to strengthen both critical thinking and oral communication skills. By using such an approach, students are required to examine in-depth specifically assigned health conditions as related to anesthesia practice and evaluate the current evidence-based approaches for best anesthetic management. The group presentations assist students in developing skills and strategies, which foster clear, concise, professional verbal and writing communication. In addition, the students increase their ability to critically evaluate scholarly sources and collaborate in a group setting. Multimedia – MPEG4 (*.m4v, *mp4). During the semester student case presentations were recorded using BlackBoard (BB) Collaborate at the University of Miami. The purpose of the presentations was to strengthen both student critical thinking and oral communication skills. By using such an approach, students are required to examine in-depth the physiology and pathophysiology of a specifically-assigned health condition as related to nurse anesthesia practice and evaluate the current evidence-based literature for best patient management during the perioperative period. The presentations are assigned as a group project of 2 to 3 students. The presentations had specific guidelines and comprehensive evaluation was guided by a rubric of 8 specific questions (view here). All student presentations were recorded using BB Collaborate. The goal of the recordings was to create a library with students’ presentations. The presentations were named and converted into videos using Multi Media format MPEG4 (*.m4v, *mp4). Than, a link was created in the course content in BB where the videos were stored. All videos were accessible only by students enrolled in the course. All students had signed a talent-release form with the UM School of Nursing and Health Studies. The benefit of the recorded presentations library via BB Collaborate was the ability to provide matter-of-fact feedback points to the students. This is similar to the nurse anesthesia simulation scenarios debriefing process, with which faculty and students are familiar with: What is the experience? What went well? What can you change/improve next time? It was the faculty’s belief that the students after reviewing their recorded presentation were much less likely to challenge their grade. Another benefit of the library was availability to the students to review presentations and study the material at their own convenience and pace. Additionally, faculty can select and post presentations to provide an example for future classes when explaining the expectations, format, etc. 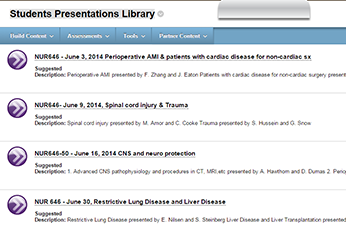 An additional benefit of building students’ presentations library was that it could be utilized as a remediation tool for a student who fell out-of-sequence with the program and required individual course enrollment. Some of the challenges encountered in recording the students’ presentations with BB Collaborate were simple fixes such as; assuring the “record” and “sound” were turned on, and scheduling instructional designer’s support in advance. Some issues were a little more complex such as discovering in the process of video conversion when the presentations were very long – over 60 min, and the conversion was taking up to one day. However, after the initial few presentations, running the BB Collaborate recording was streamlined and much more convenient than utilizing conventional video recordings.